I vividly recall watching Star Trek: Voyager for the first time in 1995. 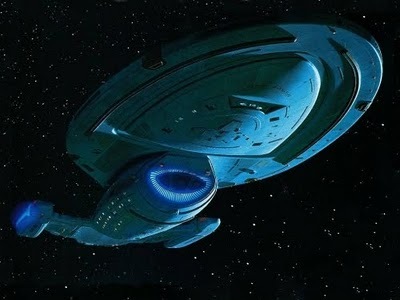 I was 25-years old...and met Voyager with great enthusiasm and hope as a continuation of the Star Trek mythos. Starting out the journey, I was impressed. Voyager was indeed more accessible than the other latter-day Treks (DS9 and Next Gen). You didn't have to know who, this week, the Cardassians were allied with to enjoy an individual storyline. In addition -- strikingly -- Voyager seems far stronger in terms of ensemble acting than some of the other spin-offs. In fact, no Star Trek TV cast before or after Voyager gelled quite so quickly or so ably. Kate Mulgrew's Captain Kathryn Janeway promptly became my favorite Star Trek Captain after James Kirk, and I loved the way that Mulgrew's distinctive voice, -- her command purr -- would transform into a sort of guttural tiger's"growl as her ship faced off against the menace of the week. I also appreciated Mulgrew's seemingly boundless energy. Janeway was a captain who hardly ever sat down in her center seat. She was constantly in motion on her command bridge as though to sit down was to slow down the mind; to miss a vital fact, or necessary information. Mulgrew was, in my opinion, a more-than-solid anchor. She brought a larger-than-life dimension to Janeway on Day One (like Shatner's Kirk), and I appreciated that mythic approach after the more work-a-day performances of Stewart and Brooks in the other spin-offs. But over the years, my enthusiasm for Star Trek: Voyager waned significantly. Looking back at the first two seasons today, you can see how the writers relied too heavily on fictional Star Trek techno-babble to save the day. Optronic relays, ODN circuits, EPS systems, baryon sweeps, Heisenberg compensators and so forth...it all just makes your eyes glaze over. There's no connection between this imaginary tech and the human experience. It's all just meaningless jargon. Simply put, there was no crisis that a good deus ex machina couldn't get the crew out of. In the humanist realm of Star Trek, reshuffling the tech-of-the-week shouldn't have been the solution to so many important crises. Not when you had a woman as strong as Janeway as a moral, emotional guide. Another problem was that the series never seemed to authentically cope with the very important idea of limited resources. I was deeply disappointed to see Voyager resort to familiar holodeck stories (only here based on Victorian literature rather than 1940s film noir). In a universe of limitations, was it really prudent to use the holodeck, especially since use of the replicator was rationed? The series attempted to explain that that holodeck worked on a different kind of energy matrix than the rest of Voyager, and therefore its energy couldn't be harnessed in other realms. Then, when Voyager unceremoniously sacked one of the most interesting characters ever created in the Star Trek universe, Kes (Jennifer Lien) -- an alien nymph (Ocampa) who had the limited lifespan of nine years -- for a 7-foot tall Amazon in a cat-suit, Borg babe Seven of Nine (Jeri Ryan), I knew the series was truly on creative life support. Here, embodied in one package, was a person who could go from childhood to puberty, to adulthood, to old age, to death. Every aspect and stage of "humanity" and the mortal existence could have been examined through Kes alone over a seven-to-nine year series span. Youthful exuberance, teenage rebellion, adult drive, middle-age regret, wise old age...acceptance of death. Just imagine the stories that could have been told as the Starfleet characters supported her through every phase of her existence. But Kes -- and all her potential -- was dumped for overt sexuality. Ryan was fine as Seven of Nine, but the commercial crassness of her appearance and her sudden prominence in the story lines (to the detriment of the other characters) was hard to forgive in a show supposedly about "human" values. Imagine just for a moment how unforgettable it would have been had Kes stayed with Voyager throughout the series and actually died of natural causes as the ship neared home in the Alpha Quadrant. This character-based story would have granted the final episode, "Endgame," a kind of melancholy, emotional, character-based lift that it clearly lacked. The joyous (a return to Earth) would have been mixed with the sad (Kes's demise), and the episode would have reflected more accurately the essence of our human existence; the way that the good often goes hand-in-hand with the bad. But this post isn't supposed to about cursing the darkness, but rather praising the things that were indeed good and memorable about Star Trek Voyager. I can say this with some degree of certainty: the early Voyager years, produced by Jeri Taylor and Michael Piller and featuring Kes, are stronger than some of the later episodes. Here's a brief survey of some high points from Season 1 and 2. The first story after the pilot "Caretaker," titled "Parallax" is a techno-babble story in terms of the scientific threat-of-the-week, but the installment nonetheless boasts authentic character fireworks as Chakotay (Robert Beltran) lobbies Captain Janeway on behalf of the volatile half-Klingon, B'Elanna Torres. Chakotay thinks she should be chief engineer; Janeway thinks she's not Starfleet material. This story is written with real passion, and is one of the few Voyager episodes that pays more than lip service to the concept of two unlike crews (Starfleet and Maquis) attempting to blend. Over the course of the episode, Janeway comes to realize that Torres boasts a thirst for knowledge similar to her own, and the rapid-fire theoretical dialogue comes across at warp speed. This show is alive with the possibilities of new discoveries, and since the characters are engaged, so is the audience. "Prime Factors" is another strong episode, primarily because it involves Voyager running afoul of an advanced, peaceful civilization that refuses to share its superior technology (and send Voyager home...)...simply on principle. This is exactly what Starfleet officers do every day with General Order One, or the Prime Directive. They deny those planets more primitive the benefit of their know-how and help. I'll never forget Captain Picard condemning a drug-addicted race to a horrible, painful fate in the Next Gen episode "Symbiosis," for instance. In Voyager's "Prime Factors," the shoe is finally on the other foot as Janeway must contend with somebody else's self-righteous sense of morality. Some Voyager crew members ultimately attempt to steal the alien technology in this episode, in a surprisingly realistic (rather than idealistic) portrayal of human beings. "Phage," "Faces" and "Deadlock" are three episodes that feature Voyager's best villain: the Vidiians, an alien race dying of a terrible plague. The Vidiians aren't interested in diplomatic relationships or treaties. They show up in space, lock onto your ship, and harvest your organs...in seconds (thanks to a weapon/medical device based on transporter-style technology). All the Vidiians care about is their continued survival, and that single-mindedness makes them Star Trek's scariest and most effective villain since the introduction of the Borg. It also makes them, perhaps, the most tragic. We learn in their introductory episode ("Phage") that the Vidiians were once a race of artists and musicians, for instance, but now their entire economy and culture is geared towards fighting the plague, the phage. In one downright vicious episode ("Deadlock"), we witness the Vidiians overtaking Voyager, and cutting crew members down in the corridors for organ harvest. It's all incredibly nightmarish. What I admire about this episode is that it deploys all these surreal, bizarre visual compositions to assert the clown's total dominance over the dreamscape and ends without bells and whistles, but rather with a one-on-one, intimate battle of the wits between Janeway and Fear. In "Resolutions," Voyager is forced to strand Captain Janeway and Chakotay together on an idyllic forest planet, and -- without regard for the cliches of the genre (evil aliens, etc.) -- the story observes simply how the two characters cope with their sudden marooning. Chakotay finds acceptance quickly, and settles into his new life without looking back or asking questions. Janeway, on the other hand, never stops fighting, and never relaxes. If she's occupied, she believes, she won't feel alone...or left behind. Again, it's just a simple story of two alternate worldviews, but it is handled in a compelling, character-based fashion. This episode also establishes a realistic and human attraction between Janeway and Chakotay, an idea that the series then ran away from in abject cowardice. Star Trek: Voyager is clearly not the paradigm shifting sci-fi outer space series that Farscape or Firefly or Battlestar Galactica proved to be. Instead, it was merely the latest in a familiar concept, tweaked and twisted to seem "new enough." I do believe that if the makers of the series had truly been bold in their choices -- turning off holodecks, featuring arguments between the two crews, and asking the characters to make moral compromises in a world of limited resources -- Voyager would be remembered today in much more positive terms. I don't know if you've given Voyager a try lately, but the good episodes are good enough ("The Thaw," "Parallax," "Deadlock," "Resolutions") that you really mourn what amounts to a lost opportunity to update and modernize the increasingly-familiar and trite Star Trek universe. Perhaps my ultimate statement on Voyager is this: a lifelong Star Trek fan, I stopped watching the series regularly by season six (about the time "The Rock" was guest-starring as an alien gladiator...). I didn't stick around to see the lost crew get home (though eventually I did watch that episode...), because I'd lost faith in the writers to wrap up the show in a novel, exciting and legitimately dramatic fashion. Star Trek:Voyager was just Trek's Lost In Space. Albeit aspired to be Space:1999, I absolutely agree with Johnny Byrne thoughts that it failed. The two seasons of Space:1999 were much more impressive than the seven seasons of Star Trek:Voyager. What I would have given for seven seasons of Space:1999! Like you John, for me Star Trek:Voyager after season five was trapped in an endless state of monotony. 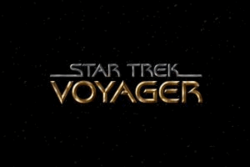 I lost interest in Voyager pretty quickly, about half way through the first season. Perhaps it was just Star Trek fatigue after NextGen and DS9, but I just didn't feel any connection with these new characters. Like you, I was looking for more of a Space:1999 sense of survival, but everything felt too comfortable and safe. And I agree with you that adding Seven of Nine was a cynical move, but I think it was rather shrewd. My brother, who never showed any interest in Star Trek or science fiction in general, suddenly became a Voyager fan after her addition. I doubt that he was seduced by the compelling storylines. First let me say how much I've been enjoying these Star Trek posts. They have provided some food for thought, a welcome sense that I'm not the only one who likes some of the more obscure or disliked episodes, and a lot of fun remembering playing with those great old Mego toys. All that said, I feel I must speak up in defense of Seven of Nine. Sure it was a cynical move adding her, and I'm cynical enough myself to believe it was just a happy accident that Jeri Ryan turned out to be a highly skilled actor. Nonetheless she did turn out so, and managed, in my opinion, to make Seven the most sympathetic character on the show. They turned out a couple of gems in the later seasons when turned eps over to Ryan and Picardo and let them run. I can hardly believe I've made my first comment here in defense of my least favorite Trek series (I agree with every other criticism of it here). Ah, well.